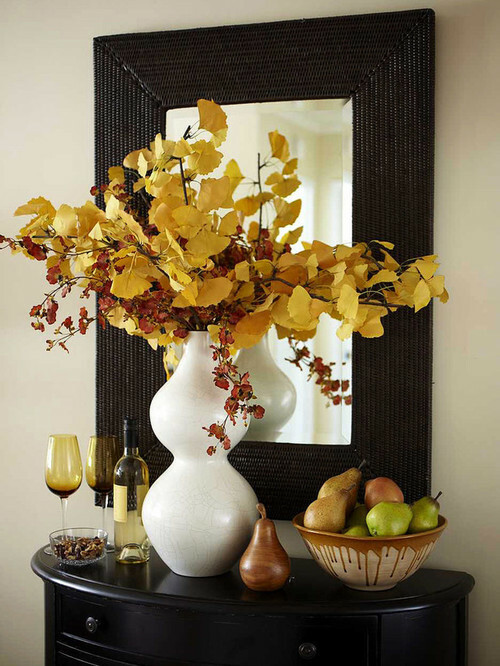 We are a little less than halfway through November – truly the last month of the year for fall decorating. Soon (or perhaps you have already) leafy, vibrant orange, yellow and golden brown wreaths, statues and centerpieces will be changed out for sparkling silver, gold, red and green accents. Before we delve into Thanksgiving decor in the next couple of weeks, we are featuring some do’s and don’ts of end-of-fall decorating, both to keep you in fall spirits and to prepare for turkey-day festivities. Share with us how you’re decorating, and let us know if you’ve already started decorating for December holidays! Create a bold entryway, especially if you host a lot of guests. This is the first space in your home they will see, and it should be welcoming with crisp, warm autumn colors and statement making accents. Season your wall art. Hang fall-themed portraits, prints and signs that are autumn-themed. You can also hang pictures of family and friends that were recently taken this fall to create a more personal, seasonal wall display. Freshen up your centerpieces. Those pumpkins you’ve had as part of your dining room centerpiece since before Halloween need to go, if they haven’t already. Throw them on your garden or lawn as compost, and either purchase new ones or use faux vegetables that will last season after season. 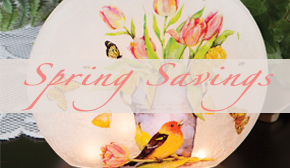 Fluff up ribbon, replace potpourri and dust figurines to keep them looking like new. Use your lighting. This is a less obvious way to decorate, but your lighting can be a great canvas on which to adorn garland and glittering accents. Drape wide ribbon on a chandelier in the dining room and place candles or accent lamps among garland and fall ornaments to achieve a display that is both beautiful and illuminated. Go for minimal. A pumpkin placed here or there inside your home may look more like a scattered pumpkin patch than put-together festive accents. Place them all together on a table, bookshelf or even your stairs; add some ribbon, glitter or just leave them how they are. It will look more appealing than randomly placed (out of place) decor. You don’t have to go all out, but it should look cohesive. Doubt the DIY. 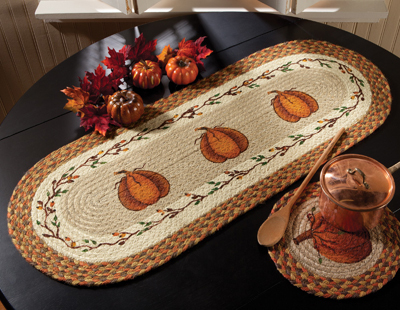 A simple banner of drawn and cut out leaves strung on a shelf or painting a pumpkin on a wood panel are equally charming as purchased decorations. DIY can often be done with other people, so get the family and even friends involved with decorating too. Forget your space needs. A lush, spell binding centerpiece on a dining room table is always impressive, but will you have to clear most of it away when guests arrive? That cornucopia filled with vegetables and decoratives looks nice in the kitchen, but do you need that counter space for prepping meals? Sort out what space you need and what you need it for before you decorate, so you don’t end up spending time on something that isn’t practical for your needs. 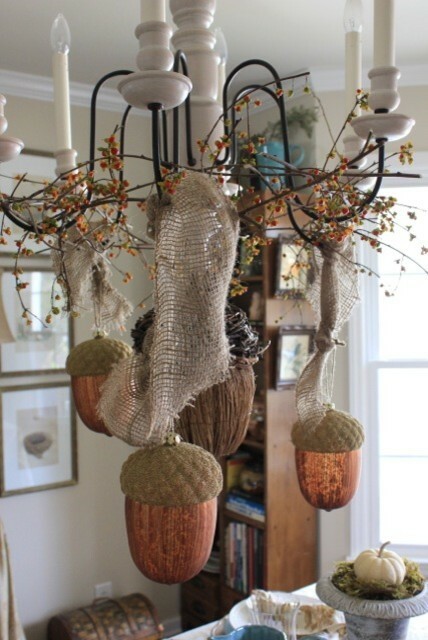 This entry was posted on Thursday, November 12th, 2015 at 3:12 pm	and is filed under DIY, Decorating, Dining Room, Harvest, Holiday Decorating, Lamps and Lighting, Seasonal Decorating, Thematic, Thursday's Theme, Wall Decor. You can follow any responses to this entry through the RSS 2.0 feed. You can leave a response, or trackback from your own site.